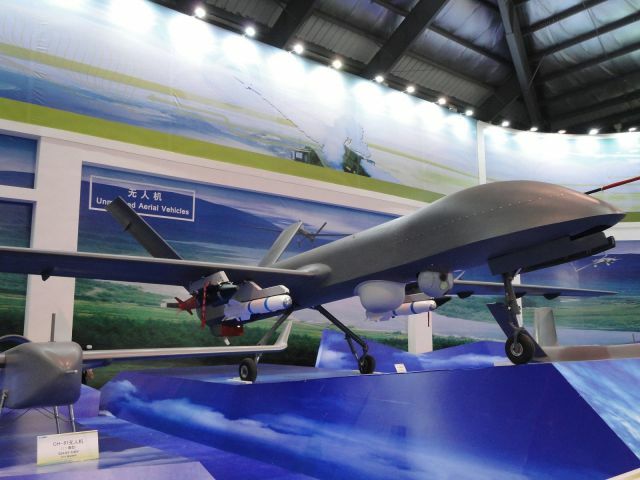 The CH-4 is a medium-altitude long-endurance (MALE) tactical UAV system. Missions envisaged include: reconnaissance, precision target localisation and designation, electronic warfare, communications relay, signal intelligence collection, battle management and digital mapping. The CH-4, developed by the CAAA, has an 18 m wingspan. The CH-4 can carry a payload of 345 kg (760 lbs) of missiles of precision-guided bombs, can reach an altitude of 8 km (26000 feet), has a range of 3,500 kilometers, and fly for up to 30 hours depending on how heavy a payload it is carrying. The mission payload adopts a modularized sensor suite including electro-optical and infrared camera, laser range-finder and laser target illuminator, communication relay and synthetic aperture (SAR). CH-4B and CH-4A have the similar appearance and construction, but with more options of combat mission payloads. It can carry up to 4 AGMSs (AR-1) or 4 precision guided bombs (60 kg level each), providing unparalleled battle effectiveness to time-sensitive targets.